I learned how to make a black walnut cake recipe years ago. If you have never eaten black walnuts, you need to try them. Unlike other nuts, they have a rich strong flavor all their own which adds an exceptional taste to cakes. Learning how to make a black walnut cake recipe reminded me of growing up in Ohio and the huge black walnut tree in our yard. It was the biggest tree that I had ever seen back then. It was very common for people to walk our country road to enjoy the scenery. Occasionally someone would stop and ask Dad to sell that tree to them for the wood. Dad always refused to sell the tree even though he always complained about having it in the yard. The walnuts made a mess when they dropped from the tree. The walnuts are inside deep green strong smelling husks. These have to be removed to get to the walnuts. These husks will stain anything that touches them. Every year our tree produced thousands of walnuts. Dad would have us gather them from the yard and lay in our driveway. Whenever cars would come to our home, they would drive over the walnuts loosen these husk. I use to think these nuts are not worth the effort but now I find myself paying for these black walnuts. Since I learned how to make a black walnut cake recipe, I find myself buying them even though they are quite expensive. Preheat oven to 350F degrees; grease and flour 3 eight inch round cake baking pans. In a large mixing bowl cream together the butter and sugar; add the egg yolks and beat well. Add the soda to the buttermilk and stir until soda dissolves. Add the flour alternately with the buttermilk to the creamed mixture; beat well after each addition. By hand stir in the vanilla, walnuts and coconut. Beat egg whites with cream of tartar until stiff peaks form; fold whites into the batter. Pour batter evenly into the three prepared pans; bake for 30 minutes or until pick comes out clean. Cool for 10 minutes, remove from pans and set until cold. Spread the following frosting recipe between layers, on sides and top of cakes. Garnish with additional black walnuts. Cream the butter and cheese until smooth; gradually add the sugar beating until light and fluffy. Stir in the vanilla. 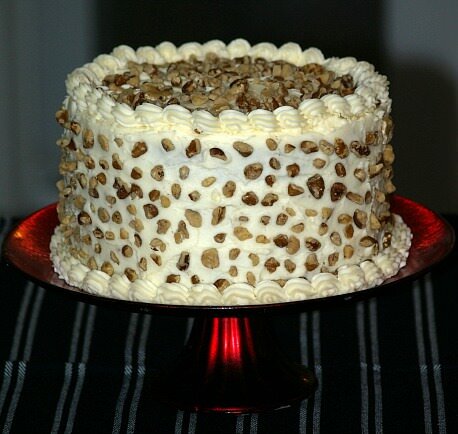 Sour cream frosting really compliments a black walnut cake recipe. Cream shortening and sugar together; add beaten yolks and beat thoroughly. Add sifted dry ingredients and milk alternating; beat well after each addition. Blend in nuts; fold in beaten egg whites. Bake at 350F degrees for 30 minutes or until pick comes out clean. Combine first 5 ingredients in saucepan and place over medium heat. Cook mixture while stirring until it begins to boil. Lower heat and simmer 5 minutes to form a thin thread. Remove from heat and pour into small bowl. Cool 10 minutes and add vanilla; beat for 5 minutes or until reaches room temperature. Beat in powdered sugar a little at a time until it reaches desired spreading consistency. Cream butter and sugar; stir soda in buttermilk. Combine all ingredients of recipe except for nuts in large mixing bowl. Beat about 4 minutes or until blended; stir in the nuts. Pour batter into 2 greased and floured 9 inch cake pans. Bake at 350F degrees for 20 to 25 minutes or until pick comes out clean. Combine all frosting ingredients in saucepan over moderate heat. Cook until a soft ball forms when dropped in cold water. Remove from heat and stir in butter and vanilla; cool and beat icing until thick. Preheat oven to 325F degrees; grease and flour 10 inch tube pan. Combine and beat butter and shortening on medium speed until smooth and creamy. Gradually add sugar while beating for about 5 minutes. Add eggs one at a time beating just until blended. Sift together flour and baking powder; add to creamed mixture alternating with the milk. Stir in black walnuts and vanilla; spoon batter into prepared pan. Preheat oven to 350F degrees; grease and flour Bundt cake pan. Beat egg WHITES on high speed until stiff peaks form; set aside. Combine and beat powdered sugar, butter and vanilla until light and fluffy. Sift together flour, baking powder, cinnamon and salt; add to creamed mixture alternating with the milk. Light fold beaten egg whites into batter; spoon batter into prepared pan. Bake cake about 50 to 55 minutes or until pick comes out clean. Cool in pan about 10 minutes; invert cake onto a wire rack and cool completely. Sift additional powdered sugar over cake; serves 12 to 14. 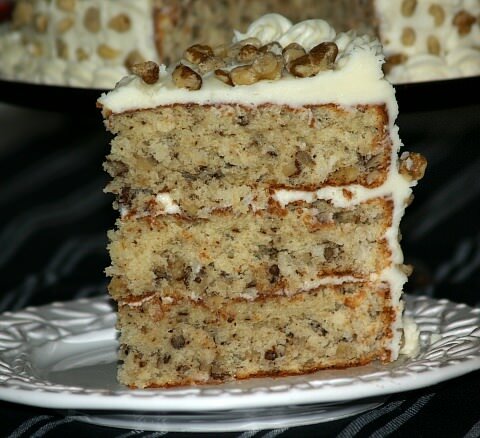 This is a smaller version of the black walnut cake. It can be bakes as a layer cake in 2 (7 inch) round cake pans, 1 (9 or 10 inch) pan or as cupcakes. Preheat oven to 350F degrees; light grease pan, line with wax paper and grease again. Combine and sift together flour baking powder and salt. Combine milk and coffee; add alternately with dry ingredients to the creamed mixture. Fold in egg whites and black walnuts until lightly blended; spoon batter into prepared pan. Bake 30 minutes; serves about 6.